When people think real-time their thoughts immediately leap to web-sockets. For many use-cases there exists a more productive approach, with good browser support hitting 100% via shims. Meet: EventSource AKA server-sent-events! EventSource is a HTTP based protocol that allows one-way evented communication from the server to the client. It avoids the overhead of polling, provides seamless reconnection without any code on your part and has an incredibly simple API. I'll take you through the server-sent events related parts of both the client and server-side of a chat application implemented via EventSource. We'll use AngularJS in the client and NodeJS in the server. The full source is available to read too. Surprisingly cruft-free for a browser API! We provide the URL of the HTTP endpoint that'll be pushing the events, and then use the addEventListener(eventName, handlerFunction) API we know and love in the DOM. Just like in the DOM we have an event object holding event data in its properties. Here we want the data - which is sent as a string. I've chosen to encode it as JSON - so we simply parse it and place it at the start of our list of chats. Simplicity itself! We simply have to set the Content-Type to text/event-stream, disable caching and tell the browser to expect chunked encoding. Each event is sent as a number of headers (event:, data:) separated by new-lines, with a double new-line between events. You can see we're accepting POST /users requests, and asynchronously responding based on the result of creating a user. We start off by sending the server-sent event headers. After that we can keep sending new events separated by double-newlines. We're proxying events from a NodeJS EventEmitter through to the browser in 20 lines of code! A fully-featured implementation would only need the ability to send through the last event ID the client had received, and we'd have seamless reconnection functionality. 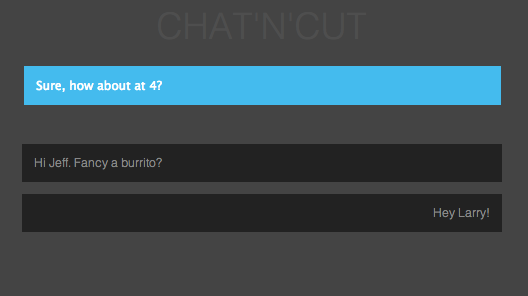 Once we boot up the server we have a functional, if incredibly simple, chat application! I hope this quick run-down whetted your appetite for EventSource. I think it's one of those rare browser APIs that leaves you thankful to its designers for making your life easy. Please check out the completed example and have a play!